According to the Gallup State of the American Workplace report, the number of employees working remotely in some capacity is increasing, and so is the amount of time they are working off-site, away from their managers and colleagues. While many workplaces may be trending towards remote working, not everyone is embracing this change. Managers who are used to a more “traditional” work environment with employees starting at nine and leaving at five and teams working together in close proximity at the same bricks and mortar location may have concerns about employees being “out of the office”. They often cite negative impacts on collaboration, performance and even the bottom line, and worry that employee engagement and productivity will suffer. Proponents of remote working could argue the same negative impacts can occur in the office. The open concept work spaces that are so popular today are often distracting, employees are constantly being interrupted by colleagues who have questions, comments or just want to chat, and that can lead to a loss of concentration and lower productivity among workers in this environment. These days, many people are searching for positions offering the option of working remotely, in some cases accepting lower pay for the flexibility to work off-site. They may also choose jobs that have a combination of remote and on-site work, working out the time balance with their managers based on HR policy. Companies also benefit from remote working options. They can recruit the best talent for the job, not having to select a person based on their proximity to the company’s office. An organization may even find they can save on the expenses of office space and other fixed costs such as electricity, heating and internet if the majority of their employees work off-site. The companies that will achieve the greatest success with their remote workforces are those that implement an effective management process. Managing a remote workforce is a two-way street. Employees need to understand the expectations of management and be provided with remote workforce training. Managers need to be trained on the best practices for managing remote employees. Here are five tips on training for managers. Give employees the tools they need. Just as when they are working in the office, employees need certain tools to succeed. Be sure they have a computer, cellphone and other devices. They will also need technology such as collaboration tools and access to company portals to be sure they can get the documents and information to do their job. Get IT involved to ensure the access is secure. Set clear goals and objectives. For employees to succeed, they need to understand the role and expectations of the position. Set weekly, monthly and quarterly goals, and implement tracking tools that will help employees manage their time. Schedule formal and informal check-ins. When working remotely you can’t just pop your head in the office door to ask a question. Use tools like email, chat or Skype to provide a quick connection for asking questions throughout the day. Video chat is a great tool to use for more formal weekly check-ins. Create a reporting system. To keep everyone up to speed between regular check-ins, develop a reporting system the whole team can work with on the platform that is best suited to the situation. Plan time with team members. Besides checking in with their managers, employees need to meet and collaborate with team members in their departments or on specific projects. To keep the team members working well together, schedule regular meetings, using video collaboration tools when possible. Successful businesses must adapt in order to remain competitive when recruiting and retaining talent and a big part of this includes training for managers on how to effectively manage remote workers. 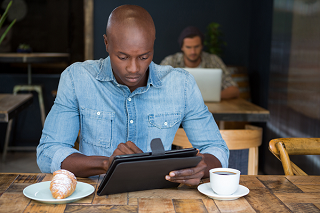 Download 10 Tips to Effectively Managing Your Remote Workforce to help you do just that. If you’re looking for additional guidance, information and assistance to create an effective manager training program for your business leaders, contact the global training experts at TrainingFolks today.